Before Mickey, there was Oswald, the floppy-eared star of Walt Disney's first cartoon series, Oswald the Lucky Rabbit. Fun and mischievous, the cheerful rabbit's popularity quickly multiplied, and so did his shorts. Between 1927 and 1928, Disney created a bounty of legendary and rarely seen Oswald cartoons. Now for the first time ever on DVD, we present the definitive collection of Disney's Oswald shorts - all featuring new scores composed especially for this release. The long-lost rabbit's life story, from his birth to his long-awaited return to Disney, and a documentary on the legendary Ub Iwerks are revealing portraits of one of the most important stars in Disney's menagerie. Featuring exclusive introductions by film historian Leonard Maltin, this is a timeless collection from generations past for generations to come. Back before Mickey Mouse revolutionized cinema, Walt Disney promoted the antics of another cartoon critter: Oswald the Lucky Rabbit. Indeed, the departure of Oswald led to the creation of Mickey. Disney lost the rights to his bunny creation and needed a new main character. The result was literally history. Normally I offer reviews of the individual shorts, but I decided not to do so for Oswald. I made that choice simply because the cartoons aren’t very good by modern standards – or even the standards of a few years after their creation. Make no mistake: fans who buy Oswald will do so for its historical value, not because they expect great entertainment value. Does that mean the cartoons are without merit? No, though viewers should keep their expectations in check. There’s a definite sameness to most of these shorts. Oswald usually pursues some love interest, and he always gets into a conflict with some other party. Much of the time this reflects a romantic rival, but it could be a foe due to other issues. For instance, “Mounted” sends Oswald to catch a baddie, while “Ocean Hop” pits him against another contestant in a race. Minor variations aside, the shorts often feel a lot alike. They do present quite a few clever bits, though, especially in the surreal nature of Oswald’s universe. From the very start, the cartoons establish a freaky world in which anything goes. Oswald can disconnect his leg to kiss his “lucky rabbit’s foot”, and things become crazier as they progress. During “Bright Lights”, Oswald gets hit and he turns into a bunch of little Oswalds. That flair for the surreal helps keep things interesting, so despite the minimal plotting, the Oswald cartoons muster basic entertainment value. However, they simply never become terribly interesting on their own. They’re much more valuable for their historic value, especially when we think of them as pre-Mickey Mouse efforts. As I alluded earlier, Disney invented Mickey because he lost the rights to Oswald. He needed a new cartoon protagonist and the Mouse was the result. Walt didn’t stray far from the Oswald template, though, as Mickey was really nothing more than the Lucky Rabbit with some minor design alterations. It doesn’t take much effort to see Mickey in Oswald; change the ears and they’re very, very similar. Don’t expect Oswald to behave like the good-natured, happy-go-lucky Mickey known to most, though. Disney didn’t turn Mickey into the bland guy we now know until a few years into his run; at the start, he was surlier and more aggressive. The Mickey of the late Twenties was an extension of Oswald – so much so that it’s amazing Walt wasn’t sued for stealing his own character! Do any of the shorts stand out as particularly memorable? Not really, though the series showed some signs of live toward the end. The last couple of cartoons relied less of the same romance/conflict formula seen in their predecessors. They still came with many of the same elements, so they’ll seem familiar, but at least they demonstrated a few indications that the series might grow. And grow it did, in a way, under the Mickey banner. Would Oswald have become an international icon ala Mickey Mouse? We’ll never know, but I am happy to get a glimpse of these historic shorts. They’re not the most entertaining in the world, but they’re fun to see. The Adventures of Oswald the Lucky Rabbit appears in an aspect ratio of 1.33:1 on this single-sided, double-layered DVD; due to those dimensions, the image has not been enhanced for 16X9 televisions. All of the shorts used the entire 1.33:1 frame on my TV except for “Tall Timber”, which was severely windowboxed; the cartoon showed thick black borders on all four sides. I would’ve liked windowboxing for all the shorts, as some appeared to lose information on the sides, though not to the degree seen in “Timber”; it didn’t need such excessive windowboxing. In an introduction found here, we’re told about the challenges related to finding and restoring these shorts. Since Disney didn’t own the rights to Oswald until recently, they didn’t maintain the cartoons in their vault. We’ve come to expect a high standard of quality from the material produced by Disney, so I went into the Oswald clips with expectations that they wouldn’t look particularly good. To my pleasant surprise, the shorts usually offered pretty solid visuals, especially when I factored in their advanced age. All of these films were created about 80 years ago, but they didn’t often show the expected problems. Of course, the results were up and down, but they satisfied much of the time. Sharpness looked good through most of the shorts. Mild to moderate softness interfered at times, but rarely to a distracting level. “Sky Scrappers” was probably the worst offender in that regard, as it showed spotty definition, and it wasn’t the only cartoon to display iffy delineation. However, I felt pleased with the sharpness most of the time. I did feel that “Rival Romeos” came across as a little too sharp. It displayed a slightly harsh, edgy look that had a “digital” feel to it. This also made it seem a bit grainier than expected, though not to a serious degree. Speaking of source issues, the shorts usually looked surprisingly clean. Of course, more than a few flaws cropped up along the way. I saw sporadic examples of specks, tears, debris and other marks. These weren’t a constant issue, and they never seemed heavy. Sure, they created some minor distractions, but they were much less of a factor than I expected. Contrast also could vary. Many shorts presented nice white and black levels; the cartoons used simplistic visual schemes, so there weren’t many shades of gray. At times, though, matters became murkier. Some shorts looked a bit blotchy; indeed, during “Mechanical Cow”, Oswald often looked like a blob. Despite some muddiness, though, the cartoons appeared reasonably vivid most of the time. Overall, the shorts were rarely pristine, but they looked very good given their age. No age-related concerns came with the Dolby Stereo 2.0 soundtrack of Oswald. That’s because these shorts were silent and the DVD offered new musical accompaniment recorded for the set. A few effects cropped up throughout the cartoons, but these were rare and usually percussion-based anyway. That meant music encompassed 99 percent of the audio, and the scores worked well. They usually featured very nice stereo imaging. Oddly, “Bright Lights” appeared to be totally monaural; I have no idea why that one only used the center channel, but I didn’t hear anything from the sides for it. Otherwise the music spread across the front speakers in a satisfying manner. Audio quality also seemed good. The scores displayed nice vivacity and range. Actually, I thought low-end could’ve been a little more prominent, as the music wasn’t tremendously dynamic, but that was a minor complaint. In the end, I felt the audio was perfectly satisfactory. Bright Lights: Maltin and Beck. Across these tracks, we get general notes about the shorts and the Oswald series. We learn about some of the animators, the era in which they came out, subsequent edits, and a few other related topics. The chats are amiable but not especially informative. Beck does best of the bunch, as his discussions provide the highest prevalence of facts. The others tend to be more general and less interesting. They’re quick and worth a listen, but the commentaries don’t stand out as particularly memorable. Next comes a 13-minute and 52-second featurette called Oswald Comes Home. 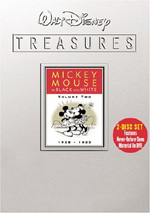 This piece includes remarks from Maltin, Kausler, Walt Disney Company president/CEO Bob Iger, Walt Disney Company former senior executive/director emeritus/consultant Roy E. Disney, son of animator Ub Iwerks/Disney Studio veteran Don Iwerks, animation historian Russell Merritt, and Walt Disney’s daughter Diane Disney Miller. “Home” tells us a little about the development of the Disney Studios and how Oswald came to life. We also hear about aspects of the character’s shorts, promotional efforts, and how Disney lost the rights to the character. The program seems a little superficial but it gives us a decent synopsis of the important subjects connected to Oswald. A “fragment” of a short titled Sagebrush Sadie lasts 62 seconds. Sadie has gone missing, so these brief bits of rough pencil animation act as all that remains of it. They’re interesting for historical purposes. 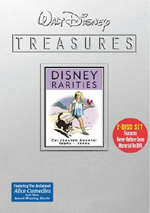 As with all of the Walt Disney Treasures releases, this one includes a Leonard Maltin Introduction. He chats for three minutes, 31 seconds as he discusses the history of the Oswald character, some aspects of the shorts, and Disney’s attempts to restore the cartoons. As always, Maltin provides a good lead-in to the set. We finish DVD One with some Galleries. We find 60 stills here, most of which show promotional materials from the 1920s. A few rough sketches appear as well, but the advertising elements dominate. I like the clips and think they add to the package. 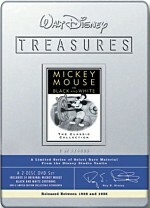 Over on DVD Two, the main attraction comes from a documentary called The Hand Behind the Mouse: The Ub Iwerks Story. Narrated by Kelsey Grammer, this one-hour, 31-minute and 38-second film offers the standard mix of film elements, archival pieces, and interviews. We hear from Kausler, Merritt, Roy E. Disney, Don Iwerks, Maltin, filmmaker John Lasseter, animation director Chuck Jones, animators Ollie Johnston and Mark Davis, Walt Disney archivist Dave Smith, actors “Tippi” Hedren and Virginia Davis, Ub Iwerks’ assistant Bob Broughton, Disney artist/designer John Hench, Ub Iwerks Studio animator Ed Friedman, visual effects supervisor Richard Edlund, and film historian Joe Adamson. As expected, “Hand” looks at the life and career of Ub Iwerks. We get info about his childhood, move into animation, and connection with Walt Disney. From there it traces his work over the years along with other personal subjects. While we do touch on the latter at times, this isn’t “Ub Iwerks Uncensored”. Other than notes about some childhood problems, the tone stays peppy and focused on Iwerks’ career. Which is all fine with me, as that’s the material I’d prefer to hear. I’m never wild about the whole tawdry “Behind the Music” structure anyway, and such a take would seem inappropriate here. So don’t expect much dirt, but do expect a very nice overview of Iwerks’ career. Lots of good archival bits show up here – especially via the clips from obscure shorts - and we get a good appreciation for what Iwerks did and his influence on animation. “Hand” becomes a satisfying documentary. Entitled The Work of Ub Iwerks, we find a sampling of Iwerks' shorts at Disney. The set includes three from the pre-Oswald period (Alice Gets Stung, Alice in the Wooly West, and Alice's Balloon Race) and three from the post-Oswald era (Plane Crazy, Steamboat Willie and Skeleton Dance). Note that although the three post-Oswald shorts can be found in other collections, I believe the three "Alice" films are exclusive to this set. That makes them particularly valuable, though the others are fun to see as well. DVD Two includes another Leonard Maltin Introduction. During this two-minute and four-second piece, Maltin tells us a little about Ub Iwerks, the main subject of DVD Two. He also gives us a quick overview of the disc’s elements. A few non-disc-based elements also appear. The DVD’s booklet includes a short text overview from Maltin as well as some archival images. 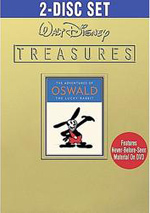 An insert card also displays some pencil sketches created for a missing Oswald short, and the package boasts a little Oswald button as well. Should animation fans expect brilliant animation and comedy from The Adventures of Oswald the Lucky Rabbit? No, but to worry about that misses the point. This collection exists for animation buffs who want to see a slice of history, and in that regard, it succeeds. The DVD provides dated but generally very good picture along with good audio and some generally interesting extras. Adventures is a must-have for animation fans.